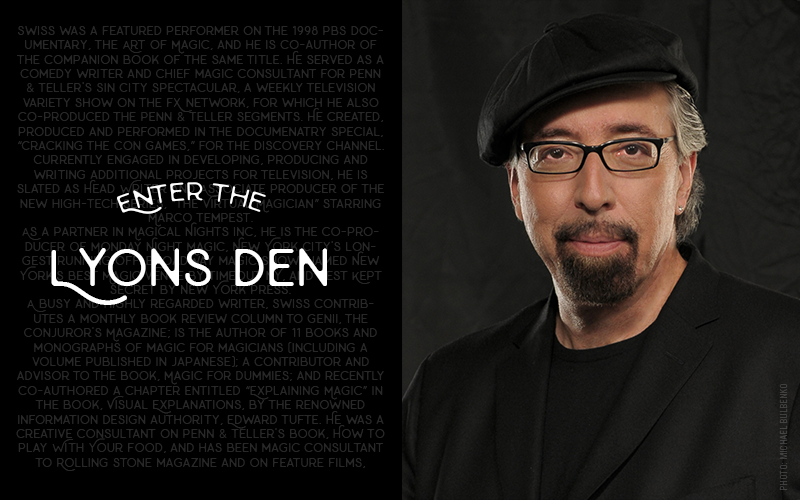 Magicana is pleased to announce the Lyons Den, a new column of commentary and reviews by Jamy Ian Swiss. Jamy Ian Swiss is considered one of the most insightful, frank and honest critics in the history of magic. He is also recognized as one of the premier sleight-of-hand artists in the world today and has appeared on many television shows, including multiple performances on The Today Show and The Late, Late Show with Craig Ferguson. Mr. Swiss’s work has been profiled in various publications including The New Yorker, and he has served as writer and consultant for a number of television projects including Penn & Teller’s Sin City Spectacular and the high-tech series, The Virtual Magician for Marco Tempest. He was also a featured performer for the PBS documentary, The Art of Magic, and co-authored a companion book of the same title. Mr. Swiss is also the author of Shattering Illusions and Devious Standards. For more information about the Lyons Den or Mr. Swiss, please contact Julie Eng, Executive Director of Magicana (julie@magicana.com). Magicana is a performance arts organization and registered charity dedicated to the study, exploration and advancement of magic as a performing art. It is located in Toronto, Canada but also operates internationally through its online initiatives. For more information, visit www.magicana.com.